Born out of the early 80�s Austin noise punk scene, Scratch Acid�s eventual permanent lineup consisted of David Yow on vocals, Brett Bradford on guitar, David Wm. Sims on bass, and Rey Washam (Big Boys) on drums. After putting out a self-titled EP and the full length Just Keep Eating, Touch and Go released the band�s scathing Berserker EP in 1987. The band broke up after the long tour that followed the release, and David and Rey joined up briefly with Steve Albini in Rapeman. 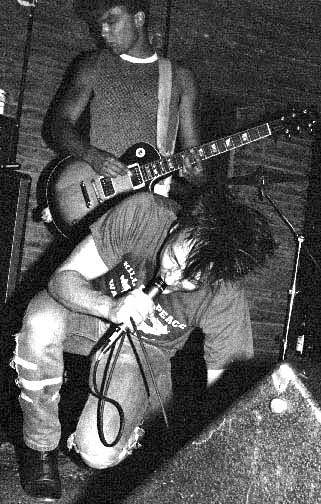 After Rapeman broke up, the two Davids formed The Jesus Lizard. In 1991, Touch and Go released The Greatest Gift, which collected all of Scratch Acid�s recorded output.